James took interest early as the school boarding teacher and moved to improve Morpus Primary School. He remembers how the mud walled class-rooms were falling apart, and the desks were broken when he moved here. He managed to use local material and mobilized the parents to repair the classrooms. 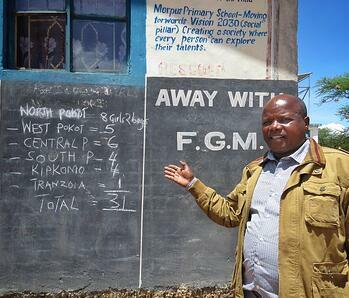 “FGM and early [child] marriage has been a big problem in the area. Girl’s population with boys in class was balanced until grade 5, when girls’ dropped to about 5-10% of the class,” shared Lokuk. This was due to the strong pull of FGM/C and child marriage as a cultural practice. The arrival of the Child Protection Project as part of World Vision’s commitment to confronting violence against children was a blessing to the girls and children in the area. The project promotes girls’ education in a safe environment, free from violence such as FGM/C and child marriage. Through training and advocacy, using alternative rites of passage for girls (ARPs) and Channels of Hope (COH) for churches, the violence is decreasing. "I am inspired by the need to speak for the girl child and women, who are unfairly burdened by our oppressive cultural beliefs,” says James. He recalls the year when there were 13 girls in grade 8 with no hope of proceeding to high school. They were in danger of FGM/C and being married off. 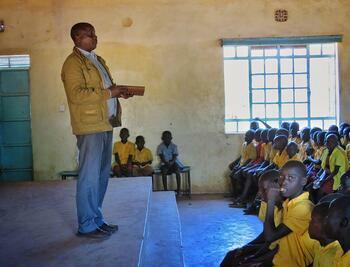 But the World Vision Child Protection project ensured they attended school in a safe environment. “I am proud when I remember some of the girls like Brenda* (now a teacher), Makena* and Grace* who have who are protected at Morpus gone through their college studies and now have a chance to make something of their lives,” he adds. These girls are now looked at with esteem in their villages, and are empowering others to gain a voice and the skills to protect themselves. World Vision has trained James in the promotion of child safe environments, child protection and school management skills. He is committed to work against any form of child abuse to ensure more and more girls restore their dreams through education.